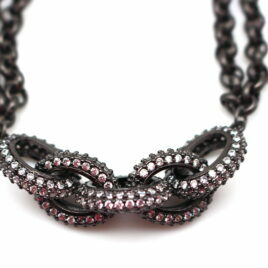 18kt gold filled 2" x 2"
snake pavé cz set in gunmetal plate 3.25 attach to your favorite necklace chain! 2" pink enamel with gold pavé cz's *add pendant to your favorite attachment necklace! 2" blue enamel with gold pavé cz's *add pendant to your favorite attachment necklace! hamsa hand 2" blue enamel with gold pavé cz's *add pendant to your favorite attachment necklace! hamsa hand 2" blue enamel with black pavé cz's add pendant to your favorite attachment chain! smiley 2.25" blue enamel add pendant to your favorite attachment chain! *comes in gunmetal, rose gold + gold // please indicate at checkout which finish you'd like to purchase! smiley 2.25" yellow enamel add pendant to your favorite attachment chain! *comes in gunmetal, rose gold + gold // please indicate at checkout which finish you'd like to purchase! smiley 2.25" deep red enamel add pendant to your favorite attachment chain! *comes in gunmetal, rose gold + gold // please indicate at checkout which finish you'd like to purchase! smiley 2.25" black enamel add pendant to your favorite attachment chain! *comes in black, gunmetal, rose gold + gold pavé crystals // please indicate at checkout which finish you'd like to purchase! smiley 2.25" pink enamel add pendant to your favorite attachment chain! *comes in gunmetal, rose gold + gold // please indicate at checkout which finish you'd like to purchase! 2" enamel with pavé cz's rolling stones inspired tongue *add pendant to your favorite attachment necklace! KENYA Choker hand beaded in Kenya matte gold lobster clasp closure in back This is a handmade item and will vary in size..please indicate at checkout if you'd like a "SMALL" ranging between 14-15" or a "LARGE" ranging from 16-17"